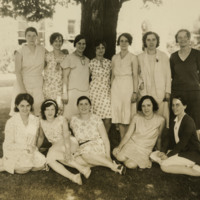 Photograph of unidentified students from Rhoads South taken in 1985. 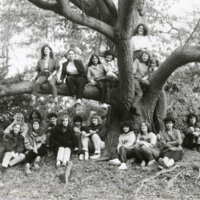 The students are photographed in front of a large tree and some are sitting underneath it or in some cases, on the tree's branches. 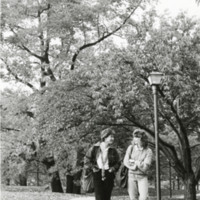 Two unidentified students pictured walking along a pathway and conversing with one another. 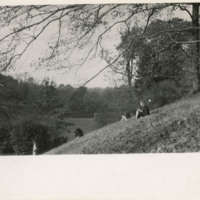 A lamp post and some large trees are visible as well. 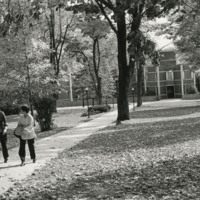 Three unidentified students are pictured walking on a path. A building and some trees are also visible in the background. 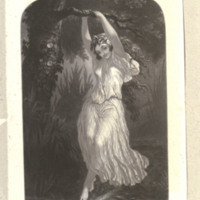 Mid 19th century Victorian print of a woman in fancy dress, barefoot and holding on to a tree branch. 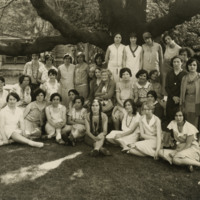 Students sitting and standing for a group photograph under a tree. 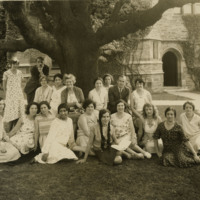 Faculty and students posing for a group photograph under a tree in front of Thomas Hall. 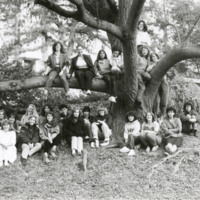 Faculty and students sitting for a group photograph under a tree in front of Thomas Hall.